As mobile phones grow increasingly sophisticated and are open to third-party applications and services, they can be used for both productivity and entertainment. If the screen is large enough, they are a convenient platform for viewing Internet-based video. They can also serve as a device to coordinate the storing and forwarding of video, both throughout and from the home. That is to say, a mobile device can be made to communicate directly with a home-based video devices, such as a networked TV. These innovations are all due to the flexibility of Web 2.0 technologies, which interconnects the User Interfaces (UIs) appearing on the cell phone, PC and TV. In collaboration with CoreCodec, Active-TV Technology is developed mobie phone applications to coordinate the viewing of of video suitable for networked-enabled phones. CoreCodec is known for its CorePlayer, which supports “multimedia content on your desktop, mobile phone, portable media player, PDA, GPS, or convergence device”. 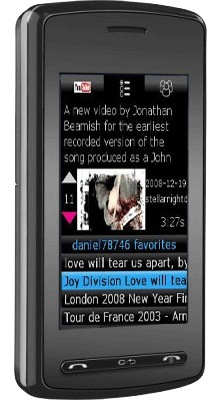 CorePlayer is widely used across the cell phone industry. The phone UI is Lua-based. A number of cell phones now support YouTube video and these early developments are just a proof-of-concept of this new technology. audio entertainment, from both Internet-broadcast and conventional-broadcast TV media. Here is a link to a BBC-Microsoft TV example, shown in the YouTube window below, where social networking and instant messaging features are combined to enable video recommendations.